On the orders of Highfather, Orion has returned home after time on Earth with Wonder Woman. Arriving in Undertown he makes short work of a Behemoth. Highfather orders him to return home and a reluctant Orion's thoughts get the better of him. Spending time on Earth, with humans, mortals, Orion realizes that he likes the life there. The Gods to him, are no longer interesting. Elsewhere, Superman is standing in front of the United States Senate. After H'el's attack the senate is understandably concerned and their thoughts are drawn to Superman's impenetrable Fortress. Superman tries to explain that despite its name and daunting architecture - its just his home. The Senate takes a stand and orders Superman to open his doors and allow them to inspect and catalogue the entire contents of the Fortress. The Senate points out they offer him citizenship despite his alien nature and as a citizen he should adhere to the rules as everyone else must. Superman again bluntly refuses offering his solemn word as consolation. The staff at the PGN are watching the live broadcast aghast. They are so caught up that they fail to notice the arrival of Morgan Edge. The PGN/GBS boss is far from happy that the newsroom is watching television. He demands to know the whereabouts of Lois Lane and is gobsmacked to hear that Perry has offered her a job as a reporter again and right now she is interviewing Superman on the steps of the Senate. During the short one to one Superman asks if Lois is back to the 'beat' and Lois acknowledges. Superman smiles approvingly and takes to the skies. 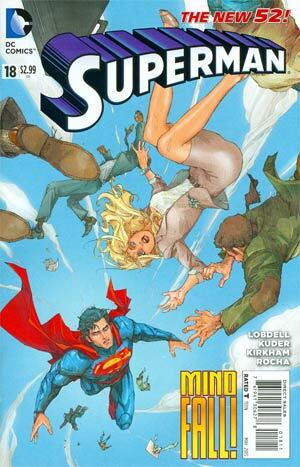 Later that night Clark meets up with Cat Grant at the happening night spot Cloud Nine. While clubbers dance, and drink flows Cat and Clark steal a couch and the blonde bombshell unveils her new project - ClarkCatRopolis.com a website running all their content. Clark is taken aback and doesn't hide his thoughts about not wanting in on the project. A project he views as an elaborate joke. Clark offers to get Cat reinstated at PGN, though Cat is desperate not to, before they can argue everyone at Cloud Nine begins joyfully leaping from the skyscraper club roof to their deaths! 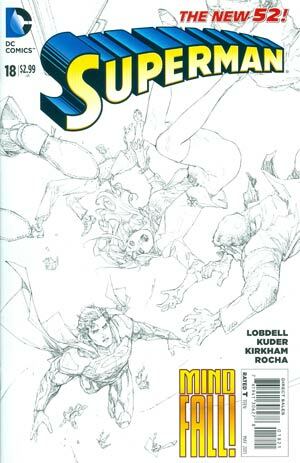 As Superman Clark races into action and rescues all the partygoers, but as fast as he does they all begin to try again. Using his x-ray vision for chemicals he detects nothing but his auditory powers hear a ghost signal being projected by the club DJ's equipment. With a blast of heat vision the equipment is a mass of molten shrapnel. The partygoers see Superman as a killjoy and when Cat steps in for an exclusive interview Superman brushes her off. The Partygoers begin to talk about distrust in Superman and the fact that he has an 'ice dungeon' which Cat picks up on her phone. Superman scans the music equipment and spots a microscopic molecular chip and takes the entire thing with him to his Fortress. Meanwhile a smug Cat broadcasts the recording and hopes that Clark will see the potential in the venture. Later it seems that the partygoers may have orchestrated at least part of the events of the night, though they aren't sure whether Superman himself was the one that was tossing them around. Someone from afar is monitoring them all with spectral vision, admiring the mischief they caused this night. At that moment in STAR Labs the staff are alerted to some strange readings. Someone in a coma that has been dormant until now has started registering brain activity, entering into a dream state. The patient is Hector Hammond and he is as they say a monster. Back to Orion and he has been granted audience to the Prophecy Wall. Highfather tries to calm the cocky God to listen to what the wall is trying to warn them about. The Prophecy Wall shows them Krypton, its death and warns that in its destruction great threat to the cosmos was born that could threaten all of existence. With one last image the Prophecy Wall depicts that threat as he is today - Superman. Story - 4: This was actually a logical aftermath to H'el, the scenes at the senate are exactly what I would have thought would happen if the situation was in real life. I found this scenario far easier to stomach than the awful Sam Lane and Project 4377 claptrap pre DCnU. I am not sure I prefer how Lois just slipped back on the beat though it is a change that definitely needed to happen - I think Morgan Edge would have done far more than just shrug at Perry in disbelief. The ClarkCatRopolis thing is so terribly named I too along with Clark thought it was an awful joke but the concept is far more interesting - like Soundcloud or a Podcast. I liked the sideline with the suicidal clubbers as a good change of pace and story beat. The two things I wasn't too thrilled about were the scenes with Orion and Hector Hammond, though now getting into Lobdell's style of writing I can see he likes to drip feed incoming story threads. Anticipation is a tool he uses incredibly well as Superman versus a New God is always a good read. Art - 3: Longtime visitors will know my irritation with juggling art chores in a book and its ever more frustrating. Each style has its own merit, I like them separately. My personal favorite is the anime style as it's not something we see in a regular Superman book. My issue is that they just don't meld together well into a uniform look. Even though an attempt is made to split the story into chunks the flow-through doesn't work. Cover Art - 4: A cool looking cover with hurling citizens but if I were to pick out a few things... where are they hurtling from and to? Also as Superman flies up to the rescue seven people have passed him on their way to a quick death!